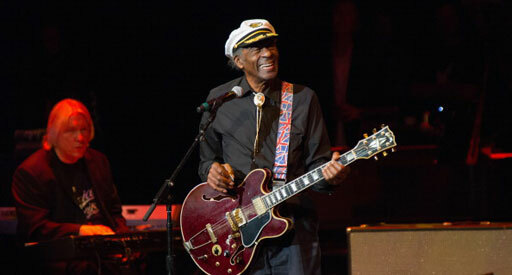 Still rockin' at 86, music legend Chuck Berry promised a comeback Saturday with six new songs, some written 16 years ago. "And as soon as I can get someone to guide me - and I do know a little about the business - I want to push them out," he told reporters at the Rock and Roll Hall of Fame and Museum, which honored him with an award and tribute concert. "I'm going to come back and push them out if you know what I mean, somehow." Berry, a rock pioneer with early hits that included "Roll Over Beethoven," ''Sweet Little Sixteen" and "Johnny B. Goode," wouldn't tip his hand in detail about the new songs or when they might be released. "They might be old, but they are the same type of music that I have been playing," he said. The lineup for Saturday night's tribute concert honoring Berry at the State Theater included Ernie Isley and Darryl DMC McDaniels, Joe Bonamassa, Rick Derringer, Rosie Flores, John Fullbright, David Johansen, Ronnie Hawkins, Steve Jordan and Merle Haggard. Berry offered some advice to the performers: "Keep rocking, keep rocking. That's two words. Next word is: Be kind to your fans." Earlier in the day, the legend struck a bittersweet tone when talking to reporters about his own mortality and diminished vocal abilities, saying he's been "wondering" about his future. "I'll give you a little piece of poetry," he said, according to the St. Louis Post-Dispatch . "My singing days have passed. My voice is gone. My throat is worn. And my lungs are going fast." Berry still performs monthly at Blueberry Hill, a club in St. Louis, and says he has no plans to slow down, adding his fans are "having a great time from memory. I hope that I can continue to enhance their memory, because it looks very dim." To mark the American Music Masters award presentation, the rock hall has mounted a special exhibition with items including Berry's stage clothes, a guitar and his 1958 Chess Records recording contract. The rock hall's new library and archives has a separate exhibit with items including Berry's 1964 British tour program and a handbill promoting his appearance with the Grateful Dead in 1968. Past American Music Masters program honorees include Aretha Franklin, Janis Joplin and Woody Guthrie. Berry, the museum's first inductee in 1986, called the award and enshrinement in the rock hall a great honor. "You can't get any higher in my profession than this building or this reason for this building," he said.